Atithi Guesthouse i Pushkar, Indien: Reservér nu! Pushkar, the quiet little town of eastern Rajasthan, is located 13 km from Ajmer, on the edge of a small & beautiful lake. Pushkar is a city of 400 temples and 52 bathing ghats. Pushkar prides itself on being the site of the only temple of the Hindu God of Creation, Brahma. Every November, the sleepy little township of Pushkar in Rajasthan, India comes alive with a riot of colors & a frenzied burst of activity. The Occasion: PUSHKAR FAIR. Very few, if at all any, fairs in the world can match the liveliness of Pushkar. Most people associate the Pushkar Fair with e world's largest camel fair. But it is much more than that.,Pushkar: the city of Lord Brahma. For ages, this land is recongnized as land of sages & Sadhus and for pilgrems . In this Holy land, just 1 km from Pushkar Bus stand & at walking distance from Pushkar Lake, is located the atithi guest house a family -run property. The decor of the place is in tune with the fabulous past of Rajasthan. 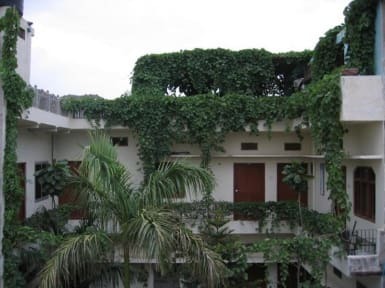 There are 10 deluex and semi deluex rooms with attached bath and shower in thae room with nice view from roof top cafe and also you can injoy with all kind fo food with movie and musicfrom all over the world .